We have just returned from a few days with our eldest son and his family, in Arizona. We watched their 4 kids for a day and a half and one night, while they had a getaway weekend in San Francisco. Sometimes I wonder how we ever raised 4 children...They have a busy schedule and it was non-stop from the minute we arrived until their parents returned home. Tired? Yes. Fun? You betcha! Cute? Endless moments of cuteness happened over the last few days. 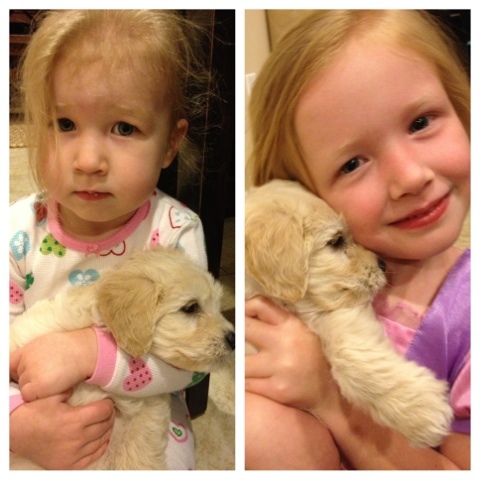 The girls love their little puppy. 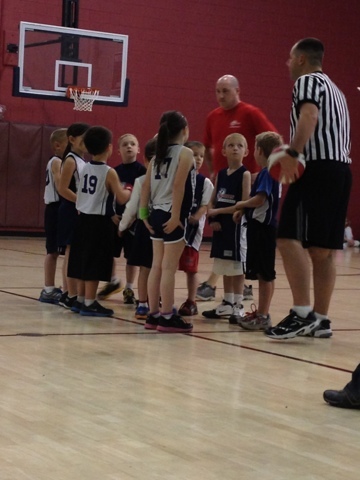 We got to see S in action on the court. 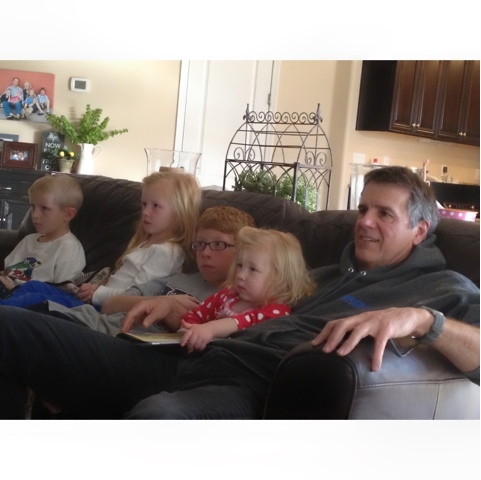 It was super cold in Arizona over the weekend, so we did a lot of movie watching and game playing. I was so excited to see this 58 year old dresser, with it's new coat of paint. My parents bought it in 1955, when they first moved to California. It was originally maple. Then my dad refinished it with an antique green when I was 12 years old and it was in my room until I got married. Then we re-inherited it after Mr. R graduated from dental school in 1976. We used it in our room and then in a guest bedroom until 1999 when #1 son got married. He and a friend stripped off the green paint and stained it a light maple. 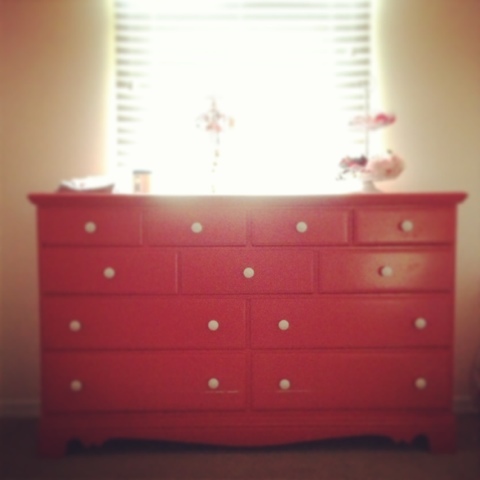 This fourth generation dresser now has a gorgeous coral red painted finish and resides in our granddaughters' bedroom. 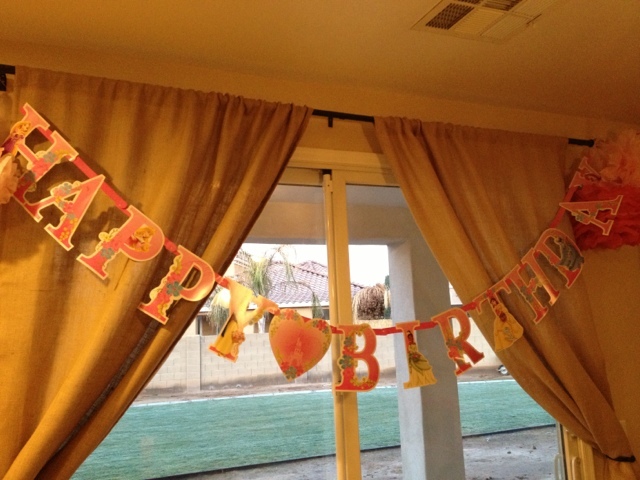 The main reason for our visit was to celebrate their youngest's second birthday. 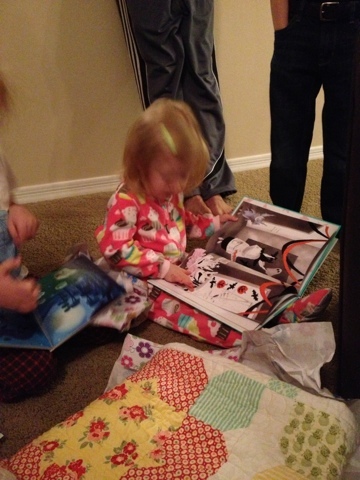 She liked her new books. 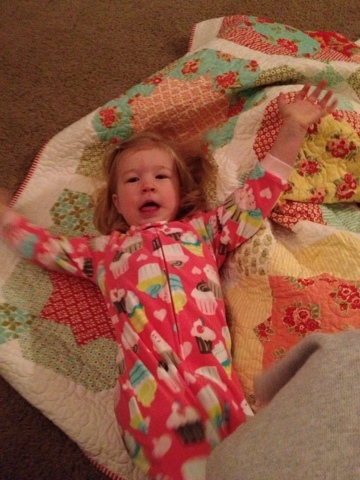 and posed on her new quilt. Papa suggested they could play a game of Twister on it. Notice how it matches the coral red dresser, and I didn't even know they had painted it when I was making this quilt. And because my daughter-in-law likes the quilt so much, and the girls share a room, she asked if I would make a matching quilt so she can use them on the girls' beds. Of course, I said yes. The fabric is already ordered. 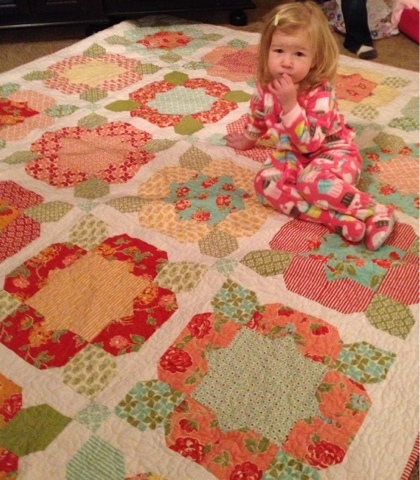 The quilt is really beautiful -love that they played Twister on it too! 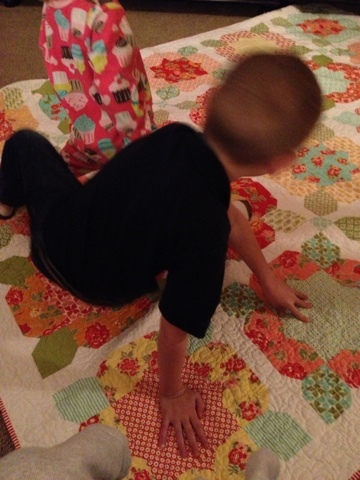 How clever to come up with a game of Twister- a truly multi-functional quilt! And you are such a good granny to offer to make another! Looks like it was a fun, but tiring weekend! I hope you're have a bit of a rest now! That sounds like a wonderful weekend! Nothing better than spending time with those little ones and having made a quilt that’s so well appreciated! Love the red drawer! Great photos! Are you going to do the same quilt pattern, or different pattern in the same fabric line so they match but are not identical? What a fun weekend! I have the same question as Canadian Abroad.....same fabric different design or the same design? What a nice compliment from your DIL to have you make another quilt. PS...adorable puppy. Is that a golden doodle? Fun post. The quilt is beautiful! How cute! Glad you had some quality time with your family! So cute! I grew up in a big family (I'm the oldest of 7) and now that I have 2 kids of my own I am in complete awe of how wonderful my mother is! Thanks for sharing all of your pictures. What a lovely compliment from your daughter-in-law. You are one blessed lady! Fab idea to play Twister on it :oD Glad you survived the babysitting! Hah! Twister . Perfect! Mind you, you got suckered into a second quilt!